In October this year, two of the brothers met up in Kolkata for a series of visits and prayers in different parts of India. One of them had been visiting in Australia and Indonesia. The other came from Bangladesh where he lives with other Taizé brothers. What a joy to begin the visits with a prayer in the “mother house” of the Missionaries of Charity! A wonderful moment spent together, it was an opportunity to recall how Brother Roger first came to India 35 years ago on the invitation of Mother Teresa. We were quite a large group: young people, friends of Ankur Kala, a NGO which works among the oppressed women and children of Calcutta, and volunteers who work with the sisters of Mother Teresa. 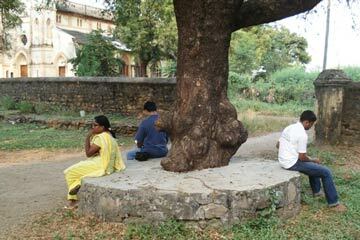 Some had come specially to pray at the tomb of Mother Teresa. It was a peaceful moment, full of gratitude for the witness of the sisters. In Kolkata there was also a prayer at the home of the sisters at Anjali Bhavan; yet another at Bishop’s College (Church of North India), prepared by two young people who had just come back after spending three months in Taizé. In Nagpur we were able to visit the different youth commissions with whom we work, as well as the Council of Churches. It is important to maintain these links: these are the people who prepare the young people who come for a longer stay in Taizé. We were made very welcome right from the start. It is clear that there is a lot of trust in what we are doing. 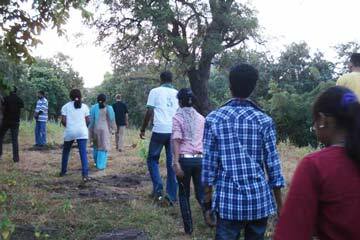 We went to Yuvagram, a village near Nagpur where we led a two day retreat. Two priests and several young people of the ICYM (Indian Catholic Youth Movement) had come especially from Delhi and elsewhere. It was impressive to see how highly motivated the participants were. The two days made it possible to sense what they are hoping for. Two of the young people will be coming to Taizé in the near future. Among those taking part was Ravi who spent three months in Taizé in 2007. He shared with everyone how his stay in Taizé had transformed his life. He is now national president of the ICYM. The last evening, there was a prayer in the parish church. It was moment that was very simple, but everyone was happy and grateful. Many children came, singing the bajans in Hindi and gathering close for the prayer around the cross. Near Nagpur, we visited an Orthodox seminary. It was wonderful to meet three of the seminarians who had spent three months in Taizé. Again we experienced a strong feeling of trust and it was good to share with all the seminarians. Near the seminary is a house for physically handicapped children. It is the seminary that takes care of this house and the seminarians work there. This very concrete commitment is part of their training. Our short stay in Mumbai enabled us to meet several priests in charge of youth ministry in the different churches. At Vasai, we met Archbishop Felix Machado who invited us to lead a morning’s reflection with forty young priests. They were very interested and eager to share! And once again we met young people who had spent time in Taizé. 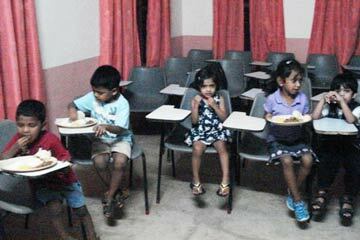 In Kerala we were warmly welcomed by the Salesians. An evening prayer was attended by the whole parish who were joined by still others. A retreat brought together a number of people who were highly motivated. As always in our meetings, the participants who come belong to different backgrounds, here from various youth organisations: “Jesus Youth”, Orthodox students, ICYM. At the end of the retreat we went to the Catholic Seminary at Alwaye. All of the 157 seminarians took part! It was a beautiful time of prayer. 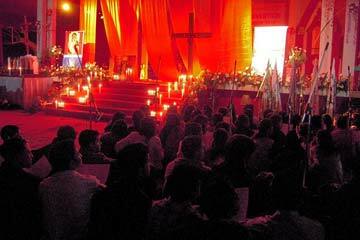 Every three years, a youth convention takes place in India, organised by the Catholic Youth Ministry. The eighth meeting of its kind was held in October 2010. Taizé brothers have been invited to take part right from the start of these meetings: a beautiful sign of the link that exists with so many young Indians who have been to Taizé or else who pray in their parishes with the songs of Taizé. This year’s meeting took place in Shillong, the capital of the State of Megalaya, situated at 2000 metres in North East India. Rising gently through the green countryside, the road is lined with tea plantations and rice fields, and later thick forest. Elephants shift tree trunks. When you arrive in Shillong you feel a pleasant coolness, quite unlike the hot cities of the interior of the country. Young adults from every corner of the country have come together; many of them have travelled for days by train, then the final stretch by bus. Even for the opening celebration, there is a joy that is quite palpable: joy in the great diversity of young people, visible in the traditional costumes, in the multiplicity of languages from different parts of the country, in the different Christian traditions. Some Christians in the South of India venerate the Apostle Thomas and celebrate with ancient church rites. Everyone is grateful for the heartfelt hospitality. Here in Megalaya, many belong to indigenous peoples (tribals), most of whom are Christian. The have been preparing for months to welcome the two thousand participants from throughout the country. The dances and the songs from different regions make the barriers come down; you can feel a communion that goes beyond frontiers. The daily meetings are held in a hall built for the purpose. “Live the Word, liberate the world” was the theme chosen for the introductions, the small group sessions and the workshops. The brothers were invited to lead two workshops and times of prayer each day. For many people, the songs from Taizé were well known; likewise for the bhajans, traditional Indian repetitive songs. The Bible texts were read in the different languages of India, beginning with Malayalam, the language of Kerala in the south of the country, to Khasi, the language of Shillong and the surrounding region. For the prayer on Saturday evening young people from the region joined the others and the hall was filled right to the doors. Some of the young Khasis had formed a choir. Singing has a long tradition in this tribe, which, incidentally, is matrilineal. Led by these marvellous voices, the prayer was extremely beautiful. The songs continued late into the night and the young people came to the Cross to pray. For the final celebration, on the Sunday morning, the Christians gathered from throughout the whole region to celebrate with the young people. There were certainly around 100,000 people filling the surrounding squares and streets, and to whom the Eucharist was brought. Everyone went home with new courage, fortified by the times of prayer, the life together and the faith that was shared. 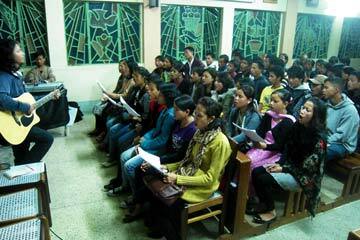 And some were once again on the road for several days before they could pass on in their daily lives what they had experienced in Shillong; in their youth groups in different parts of the country. In a great diversity and with many differences, and yet united in a faith that goes beyond frontiers.